Friday, March 11, 2016 at 10:30 am Governor Matt Bevin officially signed Senate Concurrent Resolution 9 (SCR 9). This resolution was LINK’s first venture into legislative activity and Senator Thomas’ first piece of legislation to successfully pass and be signed by the Governor. SCR 9 more than passed… it sailed through the General Assembly receiving unanimous votes in favor of its passage every step of the way. SCR 9 was also the second piece of legislation to pass the 2016 General Assembly. SCR 9 recognizes the importance of removing barriers to breastfeeding in the Commonwealth, encourages employers to strongly support breastfeeding by proving appropriate accommodations and urges all state agencies providing maternal or child health services to promote and support breastfeeding. A concurrent resolution does not have the force of law; rather it expresses the will of the General Assembly. They provided eloquent testimony on the necessity of providing breast milk to sick babies in the NICU, the benefits of breastfeeding for all infants and the barriers to breastfeeding success in the Commonwealth. The testimony can be viewed at 3 minutes into this video. Senator Thomas and our expert panel react to Senator Kerr’s comments about breastfeeding her sons. All members of the committee voted in favor of passing SCR 9. Senator Alvarado, the only physician in the Senate, spoke about his experience with caring for breastfed infants and inquired about human milk banks. He ended up co-sponsoring SCR 9. Senator Buford, who sponsored Kentucky’s current law protecting breastfeeding in public ten years ago, committed to co-sponsoring and encouraged LINK to work to educate law enforcement agencies. Senator Kerr explained her yes vote by saying that she sent text messages to her sons during the testimony to tell them that they owe her everything because she breastfed them. She also talked about her experience as a new mother learning to breastfeed and her sponsorship of a law that exempts breastfeeding mothers from jury duty. Sen. Schickel, known for voting no on almost everything, voted yes. After all members voted, Senator Stivers, President of the Senate, asked if anyone wanted to change their vote. Every single member changed their vote to yes as they congratulated Senator Thomas on his first legislative victory. Watch the Kentucky Senate’s practical joke on Senator Thomas beginning at 52:50 here. SCR 9 made its way to the House Health and Welfare Committee on February 11, 2016. This time Dr. Lawrence Wasser, Associate Professor of Pediatrics and Director of the Newborn Nursery at the University of Louisville joined Dr. Doyle and Ms. Barbier to testify. The committee initially wanted to skip the hearing and go straight to the vote. This is usually a good thing. Sen. +++ suggests the committee go ahead and let the testimony happen since we made the trip. After our testimonies, Rep. Wuchner told a powerful story about the history of La Leche League and taking back breastfeeding. 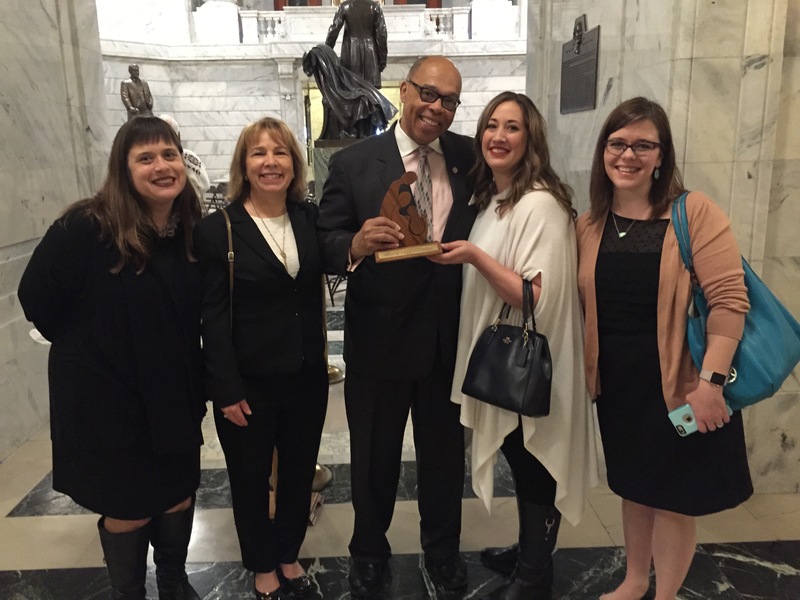 LINK was excited to learn that Rep. Wuchner started one of the first La Leche League groups in Louisville. With the final vote, Rep. Burch explains his yes vote by attributing his long life and sweet and charming personality to being a breastfed baby. SCR 9, again, passed unanimously. Our testimony starts around 20 minutes into this video. The House of Representatives brought SCR 9 up for a vote on February 17, 2016. Rep. Joni Jenkins kindly carried the resolution on the House floor. Rep. Kay remarks that he recently learned of the importance of breastfeeding during the recent birth of his son and Rep. Mills notes that he must vote yes to return home to his daughter who is a lactation counselor. SCR 9 received another unanimous vote. The vote takes place around 36:15 in this archived video. Results of the House vote! Within a 30 day period every single member of the 2016 Kentucky General Assembly voted in favor of promoting and supporting breastfeeding! After the House floor vote we waited patiently for Senate President Stivers to enroll and sign SCR 9 and send it to the Governor to sign. Follow up phone calls indicated that Senator Stivers was not going to enroll and sign it. This left us with many questions and led us to make many more phone calls. Why would Sen. Stivers refuse to enroll and sign SCR 9 when he voted in favor of it? Was this politically motivated because our sponsor is a democrat in a republican controlled Senate? As it turns out, Concurrent Resolutions do not require signature of the presiding officers or Governor, but many advocates push for it anyways, therefore exceptions to this rule are often made in Frankfort. LINK followed suit of others before us and pushed for the President of the Senate, the Speaker of the House, and the Governor to sign SCR 9. 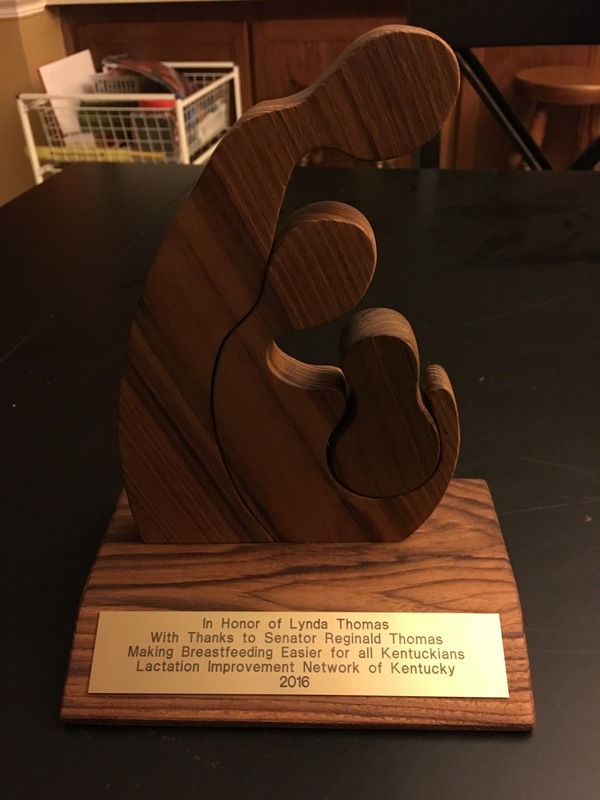 Senator Stivers’, Speaker Stumbo’s, and Governor Bevin’s signatures mark the end of SCR 9’s journey through the legislative process, but rest assured that LINK’s advocacy for breastfeeding in Frankfort does not end here! LINK President, Cerise Bouchard, Senator Thomas and his page look on as Governor Bevin signs SCR 9. 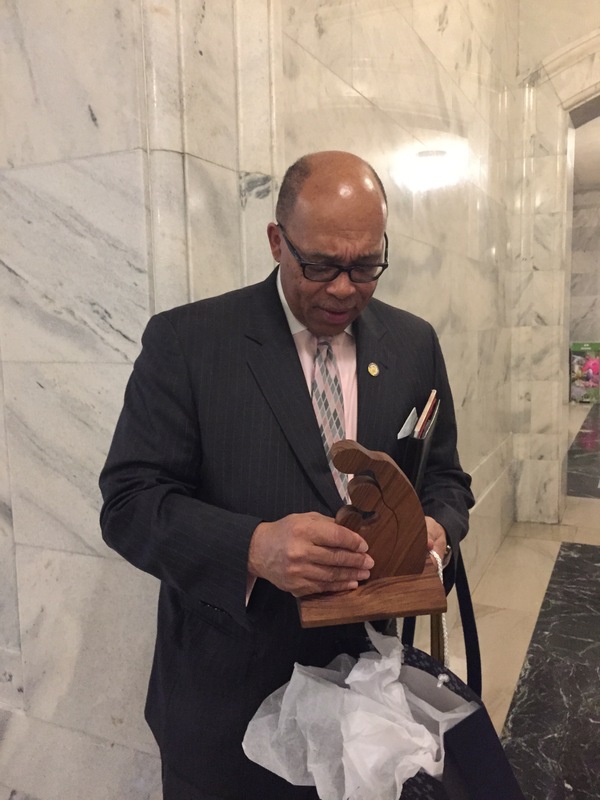 As we awaited the arrival of Governor Matt Bevin for the signing of SCR 9, LINK presented Senator Thomas with a gift to commemorate our shared legislative victory and in honor of his late wife, Lynda Thomas, who brought the need for breastfeeding legislation to his attention. Our first legislative was relatively easy, but accomplished the goals of educating our legislators and learning how the process works. LINK also worked on SB 34 with Senator Thomas, which would attach a penalty fine to the current law protecting public breastfeeding. We also supported HB 18, sponsored by Representative Joni Jenkins. HB 18 would provide civil rights protections for pregnancy, childbirth and related conditions such as breastfeeding. SB 34 needs a few tweaks and HB 18 was defeated by an unfriendly amendment. We will continue to work to work on these important public policies between now and the 2017 legislative session. This work will include working with organizations to strengthen the language of the bill, securing sponsors from both parties, and building our network of supporters. Please consider joining us in these efforts by joining the legislation steering committee (email breastfeedinglink@gmail.com) and joining the Kentucky Breastfeeding Legislation Advocates Facebook group.